PIERRE, S.D. -- A South Dakota photographer’s work is featured on the award-winning cover of Infinite West: Travels in South Dakota, a recent book published by the South Dakota State Historical Society Press. The image of a country road, captured by Chad Coppess, senior photographer for the South Dakota Department of Tourism, has led to a Benjamin Franklin Gold Award in Cover Design for the South Dakota State Historical Society Press. The Independent Book Publishers Association presents awards to publishers of the best works in specific categories. “We are excited about receiving this award. It is the first Gold Award the Press has received from the Independent Book Publishers Association,” said Nancy Tystad Koupal, director of the State Historical Society Press. Cowboy Life: The Letters of George Philip, edited by Cathie Draine, won the Benjamin Franklin Silver Award in 2008. Fraser Harrison, author of Infinite West, was also thrilled with the award. “The cover design graphically expresses the spirit of the book and its title,” Harrison said. In Infinite West: Travels in South Dakota, Harrison takes readers through the “Land of Infinite Variety.” His witty commentary paired with historical accounts place this travel memoir with those of Bill Bryson and Paul Theroux. Harrison, author of nine books, contributes regularly to major newspapers in the United Kingdom. He is currently spending the summer in Yankton, researching another book. 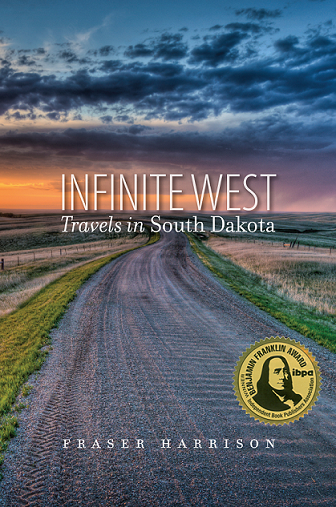 Infinite West: Travels in South Dakota is available for $17.95 plus shipping and tax and can be purchased from most bookstores or ordered directly from the South Dakota State Historical Society Press. Visit www.sdshspress.com or call (605) 773-6009.